Children resolved to continue with lots more activities for keeping our premises clean. Saving and conserving environment is a duty and responsibility that starts from an individual but permeates the entire society. 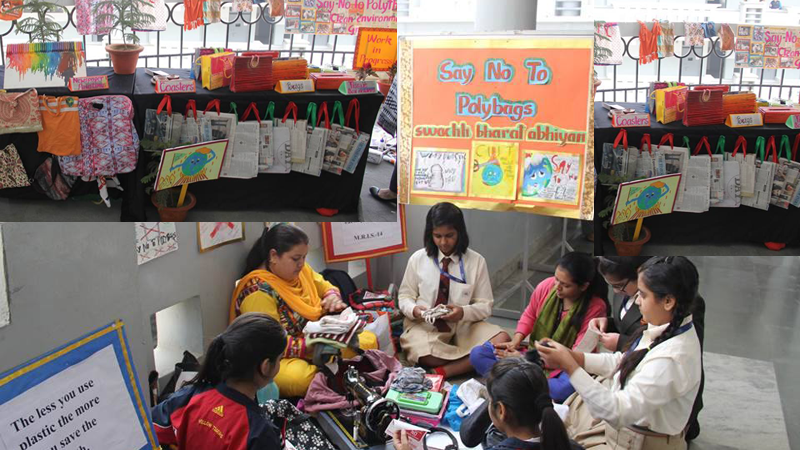 Recently, “Say no to Polythene” pledge has been taken on 20th November’14. The Deputy Commissioner, Faridabad, Shri Vijay Singh Dahiya declared Manav Rachna International is the first university of Haryana to be polythene free. Students of Manav Rachna Institutions made creative carry bags with used old t-shirts. The vision of our founder, Chairperson, Dr. O.P. Bhalla toop a new leap as MRIS, Noida joined hands to facilitate the mission of “SAY No TO PLASTIC”. Parents and staff collectively donated old clothes and school took the initiative to get the useful and attractive cloth bags stitched, resulting in the mammoth collection of 265 cloth bags. The bags were subsequently handed over to the MRIS University to be distributed amongst the people at large, in order to spread the awareness for the cause.